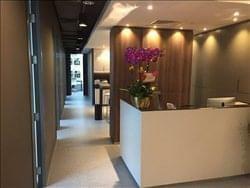 Find My Workspace lists over 95% of the serviced offices & coworking space market in Sheung Wan. Simply click Request Quote to check pricing for one office, or Add to Basket for multiple offices. This fantastic new space offers a variety of space options in this modern, stylish building. With fantastic interior design and layout this space gives way to private offices and co-working spaces and hot-desk options. With great on-site amenities, access to meeting rooms and breakout space. The centre is positioned as a “Business Enabler” for entrepreneurs and start-up business in Hong Kong. 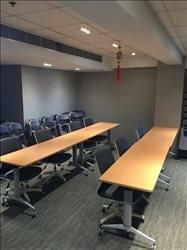 The centre dedicated to deliver a brand new “office user” experience to our business members which definitely beyond their imagination. With a revolutionary concept of maximizing the utilization of business resources, it provides not only well furnished office environment to our members, but also multiple meeting and event locations, opportunities for business networking and collaboration. Creating an environment for thinkers, imaginers, creators and achievers, this space provides work space with the flexibility you’ve always wanted. The community here inspires creativity, facilitates in the generation of new connections, and take up opportunities under the one roof with coffee in hand and the full support of the centre team behind you. No matter if you are freelancer, start-up or entrepreneur, you will find an office solution to fit your needs whether that be a private office, dedicated desk, hot desk or just a virtual office. You also have the option to dynamically size up or down based on your needs. Besides offering newly refurbished and well-furnished office space, this office offers 24 hours access to cope with your needs. With a shower room on site you can bring refresh yourself if the need arises either on your way into the office, after a lunch time work out or prior to evening plans at the end of your day. The event space also allows you to introduce and launch your ideas and inventions to the world more conveniently. This contemporary workspace offers a mix of coworking space and high-quality serviced offices in this fantastic centre. Impress your guests with amazing harbour views, quality interior design and fantastic staff services in this space. Benefit from inclusive access to casual breakout areas and meeting rooms, for anything from one-to-one catch-ups all the way to those crucial client presentations. You can also take advantage of high-speed WiFi, copying and printing facilities, and 24-hour access – all clients are catered for in this centre. Need a bit of help with the day-to-day? The on-site team are available to offer administrative and IT support, plus a myriad of reception services – no more worrying about greeting guests between meetings. All-inclusive pricing and flexible terms make this centre a must if you’re looking to expand in Hong Kong. This brand-new centre, offers private offices and coworking space where you can rub shoulders with freelancers, start-ups and business nomads alike. Whether you need a few square feet or a few hundred, this office provider can provide you with the environment you need – completely set up the way you want. You can get into the secure space 24 hours a day, and you gain access to the centre’s business club and communal kitchens – take a break and meet new people in the break-out areas, or fuel your motivation with a complimentary coffee. If you don’t need a whole office, but you’d like a fixed place to work, where you can be inspired and motivated, a dedicated desk in this office space’s coworking area is ideal. Exclusive access to a specific workstation every day, individual locker storage and all the benefits of the business club means you can connect and collaborate while having your individual space to think and work. The centre also offers bookable meeting rooms, well-designed breakout areas, and access to audio-visual equipment. Because this provider understands how quickly business can change, you’ll never be asked to sign your life away – all contract terms are flexible and tailored to your specific needs. This centre is on Des Voeux Road with well thought out features, customisable offices and interior finishes that redefine office settings. As well as being situated in an inspiring prime location that makes every day business a pleasure, it also borders the Central Business District giving you the added benefit of being at arm’s reach to improving networking, enhancing collaboration and increasing efficiency in this fast paced environment. 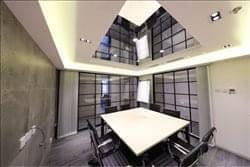 This centre is a brand-new boutique design business centre located in Sheung Wan district. It creates inspiring office and multi-functional spaces that provide an environment within which to work, to connect and to collaborate – a union of commerce, community and culture. It offers all-inclusive and well equipped serviced offices, coworking space/Hot desk, meeting room and lounge area. Clients will also enjoy one-stop-shop services including reception services, mailing handling, printing & scanning, 24-hour access, free WIFI and free drinks. This centre provides start-up solutions and services for your new business including company formation, secretarial services, bank account opening, licenses & HR services, visa applications, accounting and virtual offices. This innovative project offers all the amenities that this chain of centres are known for – a living room, bar areas, breakout areas, high-speed WiFi, meeting rooms and, of course, a dynamic and super connected Community Team. In addition to the basics, this Hub features unique characteristics such as a street level outdoor terrace, coffee bar, art gallery space, Ping Pong table, standing desks and bicycle chairs. On top of these new amenities, there is a multi-function room with a ‘Murphy’ wall that functions as a hot desk, which can swiftly be hidden to open the room for whatever the Hubbers desire, which could be easily converted into a yoga studio or a multi-functional event space. The Hub’s aesthetics will pay homage to Hong Kong and its eclectic art scene. Exterior designs will be completed by HK Walls and interior details will play with local materials such as neon, bold patina, rubber, graphics, rust, wood, painted metal, green features, steel and up-cycled old furniture. The centre provides flexible workspace solutions from Hot Desks to Private Office with all inclusive offer with no hidden expenses. The centre provides more than just a coworking space but a holistic business/workspace solutions provider which encourages collaboration, innovation and business networking. The centre provide high-Speed WiFi, complimentary printing & faxing, 24/7 Access for Office & Full-Time Members, air conditioning, outdoor terrace, mail handling, pantry and lockers for your daily office use. This centre provides a fully-furnished and equipped office unit for instant move-in. Office units are based on an individual basis. The monthly rent covers management fee, government rate, electricity allowance and high speed internet. The leasing term is flexible: from 6-24 months. It is ideal for SMEs and start-ups. The centre provides 24-hour operation and smart security system for each office access. In addition, there is event space for meetings, seminar, workshop and business functions. To obtain information for your selected Sheung Wan Serviced Offices & Coworking Space, please tick the "Add to basket" box for each office you prefer and complete the form below. We will then send a detailed report via email.